Over the last 5 decades the HB Thom Theatre has become an icon, a landmark and, some would say, a relic. It desperately needed updating to better serve our students, our theatre-goers and Stellenbosch as a whole. So, we have it one of dramatic proportions. The theatre community in Stellenbosch is a big part of the heart of Stellenbosch. The heart of this community, since 1965, has been the HB Thom theatre. And ‘has-been’ probably describes it best... Half-a century of wear and tear has made it a drab, outdated version of what it once was in the glory days. So, it’s only fair that that this icon should be calmly and yet dramatically brought, into the present. Here is how SU transitioned HB Thom into Adam Small. What exactly needed to change? Everything. Every part of SU’s beloved theatre has been getting an overhaul, which started with the venue itself. Facilities Management took the mammoth task of sourcing the necessary funding upon themselves, before they embarked on an epic transformation of the old theatre complex and which included all the complexities usually associated with the managing of such a project. What originally seated 110 patrons now seats close to 330, so the theatre can host far more elaborate, inclusive productions. The lighting was all switched to LED, giving a little extra oomph with a lot of cost-saving. The acoustics have been revamped, an orchestra pit was added and, as it stands now, there is one of the only revolving turntable on stage, so that entire sets can be changed quickly and dramatically. The overhaul came with a face-lift, too – so it’s about time you put on your fancy clothes and came to take a gander. This is not only a far more modern set-up for more professional, grandiose performances, but it is a much more exciting, dynamic environment, with many more options, for SU’s drama students to work in. It is, after all, a teaching facility, first and foremost. Speaking of students, they now have their own dedicated theatre to work in. Called The Laboratory, it will host practical examinations, physical theatre and speech, and will allow for a lot more fresh thinking on the part of the blossoming dramatics. It is a ‘black box’ in which they can experiment and push boundaries, challenge each other, and the institution of drama. To serve the corporate and business clients, a seminar room was added, complete with two digital projection screens for presentations and lectures. It can comfortably seat 100 people, and the chair and table layouts can be customised for different styles of events. Just ask the many conference attendees, churches, expos and tech labs who have already made good use of it for their own purposes. As you can see, there is a lot going on. In fact, that’s the reason it is more of a ‘complex’ than a simple, stand-alone theatre. As a hub, it draws in many more people, for many more reasons than before. It even comes with its own foyer, which can be rented separately, if needed. Built for purpose, and for profit, what was previously almost purely an educational space has now been properly updated and commercialised, which means it can put its best foot forward, well into the future. And, it is about time. At this time, Innovus partnered with the Faculty of Arts and Social Sciences and Facilities Management to work towards achieving a sustainable business model for the theatre. 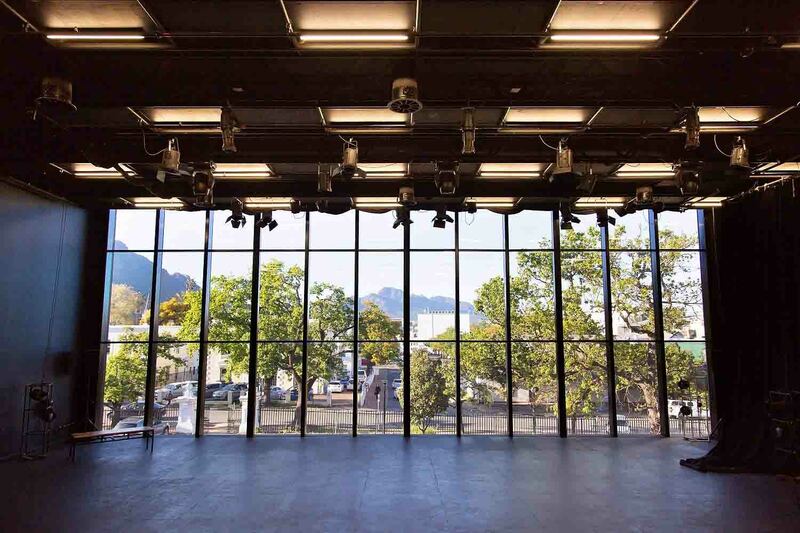 The theatre complex is now available as a spectacular event venue. Contact Catherine Channing (cchanning@sun.ac.za or 0218089195) to book it. The last thing this beloved, updated, contemporised theatre complex needed was a name that better suited its new place in our world. For this SU couldn’t think of anything better than naming it after the mid-century struggle poet, lecturer, philosopher, writer, director, founder of the Cape Flats Players and Black Consciousness Movement stalwart, Adam Small. He represents everything SU want its Theatre and the community around it to be – inclusive, challenging and game-changing. The freshly-titled Adam Small Theatre Complex is, once again, about as relevant and meaningful as you can get and officially opens its curtains on 23 November 2018. You can catch comedian Schalk Bezuidenhout performing this month – tickets at Quicket.co.za. View more photos of the Adam Small Theatre here.